MENLO PARK, Calif., July 1, 2015 /PRNewswire/ -- Magisto (www.magisto.com), the world's most popular video storytelling platform with 65 million users, today announced the launch a special Jerry Garcia editing style to celebrate the release of the Jerry Garcia Band – On Broadway Act One: October 28th, 1987 3CD set, available now at www.jerrygarcia.com. The first installment of a new Jerry Garcia archival series celebrating his magical 13-night Broadway run, Jerry Garcia Band – On Broadway Act One: October 28th, 1987, chronicles three complete, previously unreleased sets at NYC's Lunt-Fontanne Theatre: the Jerry Garcia Acoustic Band's early and late sets, and the Jerry Garcia Band's electric evening set. To celebrate both the release of Jerry Garcia Band – On Broadway Act One and the 50th anniversary of the Grateful Dead, who will make their final performance this weekend in Chicago, Magisto has created a special "Jerry Garcia" editing theme so that fans can turn their personal photos and videos, whether they're at the shows or not, into beautiful, personal movies set to music from the album, expressing their love for the music of Jerry Garcia and the Grateful Dead. 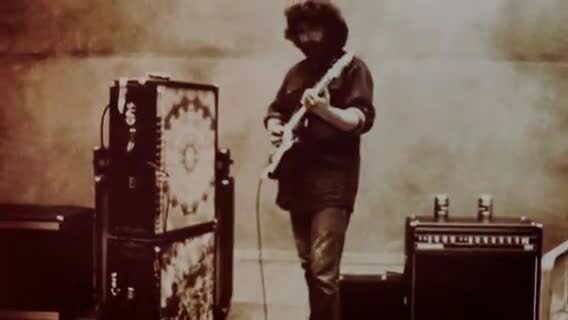 "More than any other band in history the Grateful Dead was founded in the spirit of sharing and community, which continues to this day," said Trixie Garcia, Jerry's daughter. "I'm thrilled that Magisto is adding to that legacy by giving fans a creative new way to share their love for the music of Jerry and the Grateful Dead." "Garcia's songs are actual stories with an unusually rich sense of place, character, and story arc," said Magisto CMO Reid Genauer. "Part of what made Jerry an icon was his ability to deliver those stories with intimacy and conviction. The Jerry Garcia editing theme on Magisto now lets fans express their own personal perspectives with Garcia's music through our special brand of video storytelling." The user who shares the best Magisto movie by tagging #JerryRIPS in the title, which will be selected by the Jerry Garcia estate, will receive a four-seat Presidential Booth for a show at The Capitol Theatre in Port Chester, NY, a special Jerry Garcia merchandise package including the deluxe 3CD set, and have their movie featured on jerrygarcia.com. Just download Magisto for iOS, Android or Mac, choose the Jerry Garcia editing theme, select the photos and videos you'd like to use, and include #JerryRIPS in your title. Magisto's patented artificial technology automatically selects the most compelling moments and edits them together to form a uniquely personal video story for you to celebrate the timeless music of Jerry and the Grateful Dead. The world's most popular video storytelling platform with over 65 million users, Magisto automatically turns your photos and videos into beautiful, professional-looking movies. Magisto is driven by patented artificial intelligence technology that selects the most compelling moments from your digital videos and photos and automatically edits them together to create powerful, highly shareable movies that vividly express your personal stories with customized themes, styles, and music. Magisto is available for iOS, Android, PC and the Web at www.magisto.com. Jerry Garcia (1942-1995) created an unparalleled legacy across the American landscape, most notably in his role as a founding member, singer, songwriter and lead guitarist of the Grateful Dead. Garcia's unmistakable guitar tone enchanted multitudes of "Deadheads" throughout the band's 30-year career and beyond. His work with the Jerry Garcia Band, Old and in the Way, Legion of Mary, Garcia/Grisman and projects with Merl Saunders only scratch at the surface of his musical influences as he set out to master the Great American Songbook. In June of 2015, Garcia and Robert Hunter's collaborative partnership will be recognized with an induction into the Songwriters Hall of Fame. Unequivocally devoted to the craft of music, Garcia continues to inspire future generations through the body of work he has left behind and his creative spirit.